The NBIC PhD school programme is set up along three tracks: a Technology track (T), an Application track (A) and a Life Sciences track (LS). The Technology track focuses on principles, theoretical background and application of technologies. 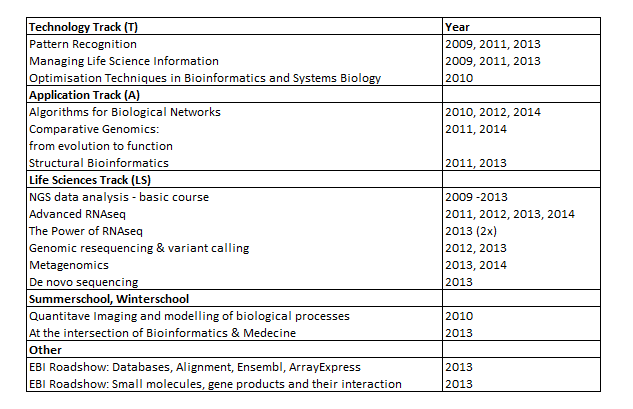 In the Application track, the emphasis is on the application of these technologies in bioinformatics. Courses in the life sciences track are aimed at researchers in the Life Sciences field who apply bioinformatics tools in their work. Each course in the T or A track is worth 3 EC and consists of one week of lectures and hands-on sessions. Courses also contain preparatory literature and a final assignment at the end. T and A courses will be repeated every two years. Life Sciences courses adhere to a less strict format, ranging from one day to several days and are always co-organized with other parties. All courses are taught by scientists active in that specific area of bioinformatics.